Friday Harbor Outstation is located in the Port of Friday Harbor Marina on San Juan Island in the United States. 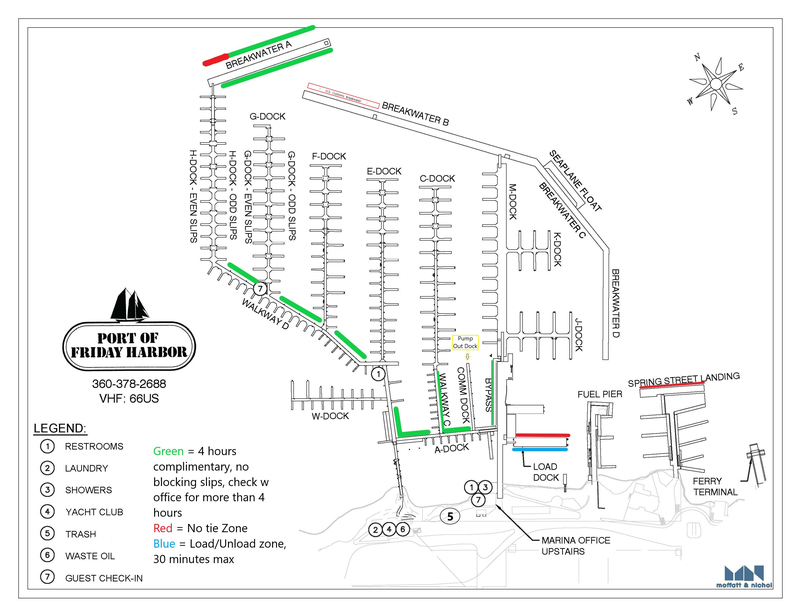 The Outstation offers year round docking facilities in the marina and convenient access to the town of Friday Harbor. RVYC leases two 40' slips, C69 and C72, at the outside end of C Dock (shown empty in the picture at right) moorage and power are free to RVYC members fresh water is available at each slip. You can book dock space at Friday Harbor through the online Outstation Booking Service on the RVYC members’ website (you must be logged in to book). Moorage at the RVYC outstations is not available to reciprocal clubs. Please note there are size restrictions when docking at the Outstations. Boats with an OAL greater than 55' are not permitted on the dock of Friday Harbor, but anchoring is an option. There are no mooring balls available for use at Friday Harbor. Upon arrival, sign the RVYC book at the Port Authority Office for each night's stay. If the office is closed, fill out the envelope provided for late arrivals: name of vessel, owner, dates. Write 'RVYC' at the top of the envelope. Place the envelope in the designated slot. Abide by all marina rules established by the Port Authority. In an effort to provide for rafting boats, 'Y' pigtails are provided at the electrical outlet at each of the two slips RVYC leases. Don't use any electrical outlets other than the designated outlets. Check out time is 1200 hours.